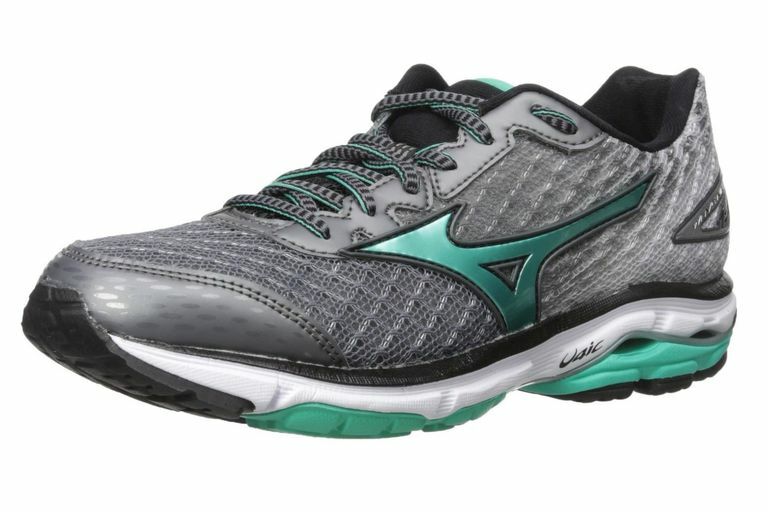 The Mizuno Wave Rider is a cushioned shoe that is good for high-mileage walkers who have a neutral gait. It is light enough in weight for speed (average of 8.5 ounces for the women's model) while still providing good cushioning. It also has stability elements. Generously sized toe box with good heel fit. Men's and women's models are available. Comes in a variety of colors, both bold and subdued. Available in narrow, normal and wide widths for women, regular and wide for men. This is not a shoe for overpronators who need motion control shoes. As a high-mileage walker, I need some cushioning to keep my feet happy for hours on end, but I also need a lightweight and flexible shoe. The Mizuno Wave Rider fills those needs. I wore the Mizuno Wave Rider through a full marathon walk and it served me well during the months of training as well as during the race. The shoe has a low heel and has a slightly undercut heel, which are both good features for walkers. It's specifically designed for heel-strikers such as walkers. With these shoes on, I feel like breaking into a racewalk, which is not my usual response to a cushioned shoe. Mizuno touts this as a responsive ride, engineered to give you a smooth transition through the heel strike to the midfoot and toe-off. The shoe feels firm but it is supporting and flexing throughout the foot motion of a step. I have a special need regarding the bunion area, and again the Mizuno Wave Rider is structured in a way that protects the bunion. In the latest designs, it has a simple mesh upper without complicated overlays that might rub your foot in the wrong way. If you overpronate and need a motion control shoe this is not the shoe for you. But if you have a neutral gait, give it a ride. Colors and Styles: You can get subdued colors for the Mizuno Wave Rider, or bold and jazzy colors. It's nice to have a choice. Widths and Sizes: Women's versions come in sizes US 6 to 12 and widths narrow, regular and wide. Men's sizes are US 7 to 15 in regular and wide. I have a wide foot and I bought the Wave Rider because it was available in women's wide and it had a wider toe box. It's a good shoe for those whose feet aren't happy with regular widths. How do the ABEO AEROsystem Walking Shoes Perform? Should You Wear Barefooters Recovery Shoes? Are Reebok EasyTone Shoes Worth Purchasing?